Some young people may be enchanted by the music, fashion and ideas of the 70's. Few of them, however, have heard about the Newell's teapot, a hit in the Computer Graphics community. 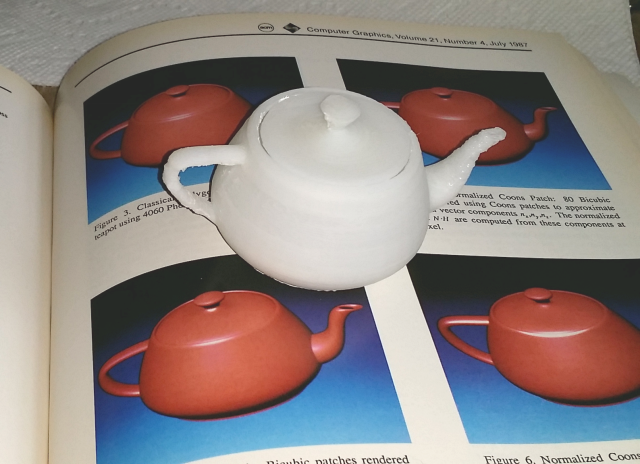 Created in 1975 by a researcher of the University of Utah - Martin Newell - , the teapot model was a star of many bench tests of new realistic graphic algorithms and techniques. You will find a historical appraisal of its pedigree in an entry of Wikipedia: "Utah Teapot". The Utah teapot dataset spread around the world beyond the following decade and may be found yet here and then. It contains the control points of 28 degree 3 Bezier patches that defines the outer surface of the main teapot body, its lid, its spout and its handle. 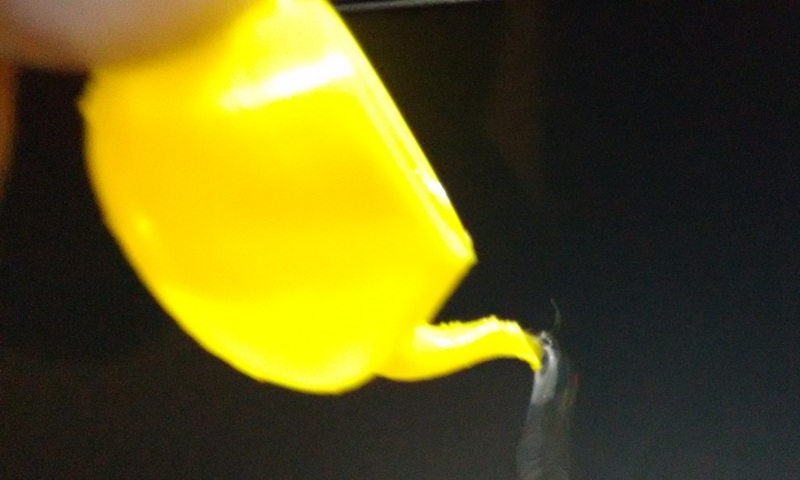 It is not a solid however. It misses the interior surfaces of the main body and the spout, has no bottom closure, and the handle doesn't meet the body nicely. I have been working in a modelling system that allows the use of Bezier surfaces as boundary of OpenSCAD models. 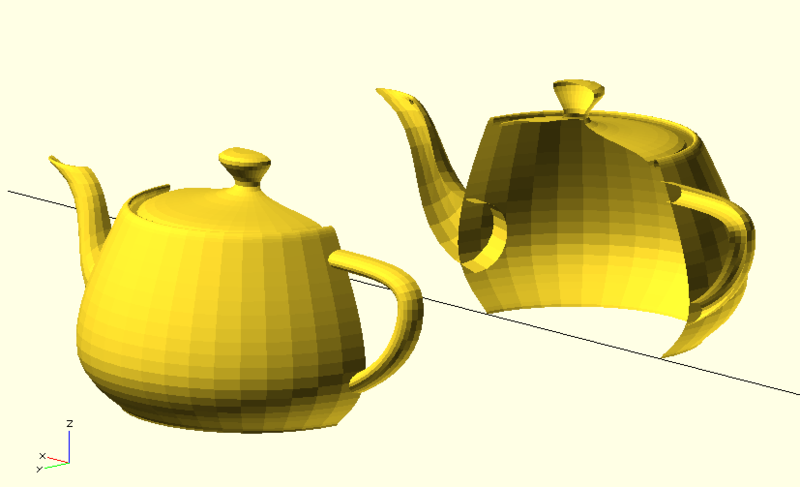 It is now under tests and I thought that the Utah Teapot would be a nice demo of the system. I have completed the teapot model correcting some imperfections in the handle and creating a internal surface where it is needed. And I got this outcome. How this model was built? Well, it is the boolean operation of 3 polyhedron (the spout, the handle and a solid to make the spout hole in the main body) and two rotate_extrude of Bezier curves (the main body and the lid). I could avoid the use of rotate_extrude but I have prefered that way to illustrate many modelling alternatives. To model the main body, I extracted the control points of a profile (section) of the main body from the dataset, and used that to feed rotate_extrude. The lid has been made the same way. For the spout and the handle, I have used the dataset patches, added patches for the spout inner surface and close their ends with planar faces. For each independent part (spout and handle), I collect all the surface information (vertices of planar faces and meshes of Bezier surfaces) and send all to a module which builds the data for a polyhedron primitive. That module scan the data, builds the vertex lists and the triangular face lists without caring to identify the common vertices of adjacent patches or adjacent to a face and a patch. So the vertex list sent to the polyhedron has many repetitions. CGAL cares to consolidate the vertex list and builds a solid when the union of all surfaces is a manyfold. 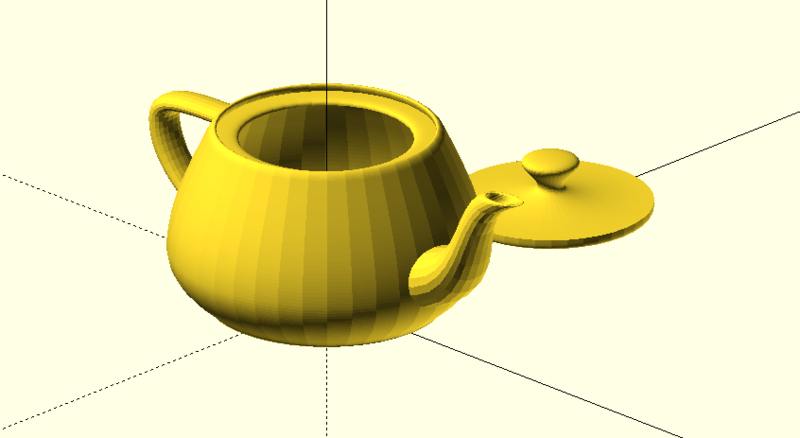 My lifemate was kind to 3D print the teapot from a stl file I generated with OpenSCAD. 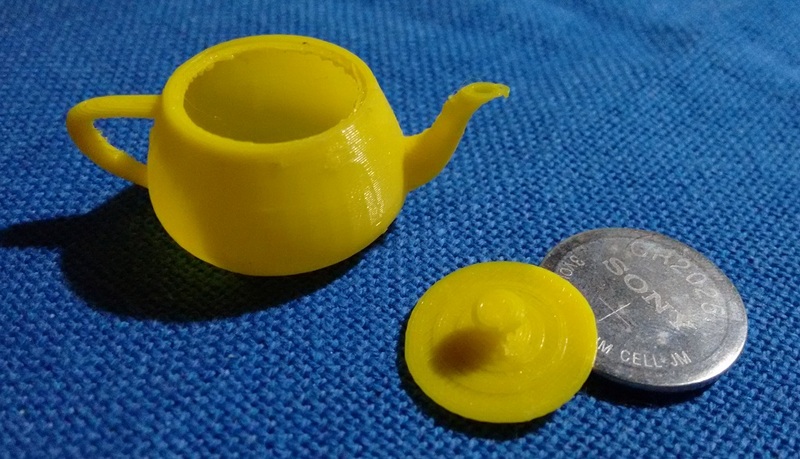 A very tiny teapot: with a diameter of only 1 inch. I was amazingly surprised that a so small version of the teapot is able to pour water from the spout! Really nice to see a physical instantiation of the Utah teapot. Thanks. > the Computer Graphics community. the trip down memory lane. I'll have to print this one out for sure. There’s a decent .stl file floating around (thingiverse?) I downloaded it and printed a full-size model a few years ago. I don’t think I want tea brewed in an ABS pot, but it appears functional. >> the Computer Graphics community. > Yes indeed. The Teapot was all the rage at SIGGRAPH for a while in the 80's. IIRC, it made the cover of the Proceedings one year. Thanks for the trip down memory lane. I'll have to print this one out for sure. I'll have to print this one out for sure. I will publish my Bezier libraries and modelling system as soon as it has been enough tested. 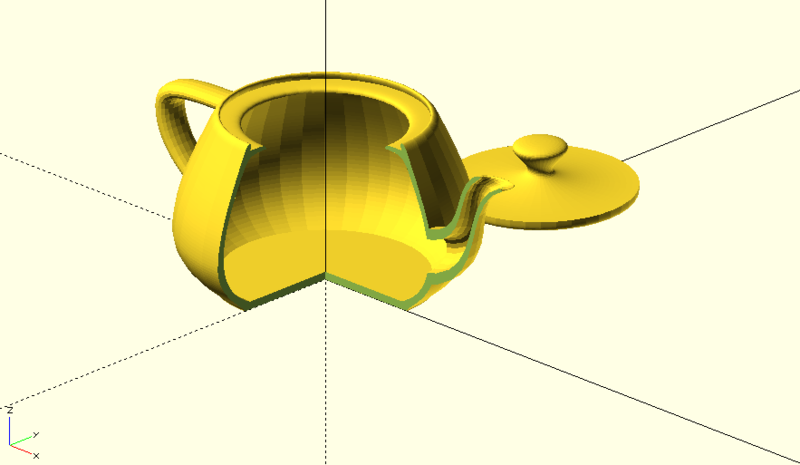 By now, for give you a glimpse of how it is used, you may take a look into the OpenSCAd file I used to render the teapot. It is a rather complete and complex demo though. Thanks, and for the source code too! That worked out very nicely without even needing support. 1987 was a big year for the Teapot at SIGGRAPH. It was featured in no fewer than three papers.